Here you can see the dents that I’m wanting to remove from the bottom of the header. I decided to just cut out the dents. Here you see my cut lines. After I hammered out the dents, I simply weld in the repaired metal. You can see the repairs that were made. Now, I just grind down the weld beads flush. After the heavy grinding is over with, I finish the whole header in 180 grit. Now, time for header paint. I was taking apart the KZ750 and got to the exhaust. The exhaust wrap I had on there was in bad shape. It was unraveling and losing its color. So I took it off. The bottom two pipes on the header had some dents. I decided to fix the dents by cutting them out and hammering them back into shape. Then I simply weld back in the pieces. After some grinding and paint the header is back in shape. I started out with the frame, a few raw materials (1” tube and 1” solid round stock) and the tail light provided by Charles. Also, I am going to be welding up a few seams where Charles made some modifications. I started out the project by making my bends. The die I am using will not make a wide enough hoop. To work around this, I have to break up the bends, resulting in a unique “pitched” hoop instead of the “normal” cafe style hoop. Once I am happy with my bends I assemble and weld the hoop pieces. At this point the hoop is together and test fitted. I look at everything to make sure the hoop is centered and looking good. To connect the hoop I turn down the solid stock to make my slugs. My slugs go 1” into the sides they connect. Also, I plug weld as well as weld the seam for strength. Here you can see the hoop welded in as well as the seams that Charles made. I trace a cut an elongated oval, and radius it to the rear of the newly installed tail hoop. This will be the backing plate for the taillight. Now for the “pocket”. I am using 20ga steel for the sheet metal work. I bend my pocket around a .5” piece of solid stock. 180 degrees. My backing plate and “pocket” fit nicely. This is how they will fit together, but first I need to remove some unwanted material. I used my backing plate to trace where I need to cut. I place a .5” OD tube where the vise grabs in order to protect the shape of my “pocket”. I am using a hack saw with a round carbide cutting blade on it. I chose this method of cutting because you can saw in any direction, but more importantly I cut all the way through allowing for even sides. And I end up with a nice steel taco!! Here I simply replaced the removed material with my backing plate. Now I need to make some room in the frame hoop to accommodate the new “pocket”. This is where my plasma cutter goes to work. Setting my pocket in for the first time and it’s looking good! I look at the piece from all sides, making little adjustments, before welding it in. Once welded, all that’s left is cutting the excess metal. And in the end I am left with a sweet little tail light pocket!! Ok, let’s put a rear hoop on this KZ 750 twin. Charles came to me needing a little work. He wanted a rear hoop and tail light installed on his bike. So I said, no problem! Charles was also wanting the tail light to be set into the frame. I first started out concentrating on the rear hoop. Measuring the distance between the frame rails I knew it was going to be wider than my dies diameter. I have run into this in the past and found that making smaller bends and bringing them together to make the right size hoop is the answer. The side effect is more of a pitched shape to the hoop rather than the conventional U shape, which I dig. I attached the hoop with solid slugs that are plug welded as well as welded at the seam. Now on to the tail light “pocket”. This is all sheet metal work and I’m using 20ga steel. I made what I call the “backing plate” first. I trace an elongated oval and cut it out. Then I radius my piece to the same curve of the new hoop. For the “pocket” I bend 20ga around a piece of .5” OD round stock, making sure it’s a 180 degree bend. Then using the “backing plate” I trace out the excess material to be removed. After it’s removed the backing plate will take its place. At this point the tail light pocket is made and needs a place to go. I cut out a section of the new hoop to make room for the pocket. Once I weld the pocket in it’s just a matter of cutting the protruding material to leave a clean profile in all directions. The light will be contoured to the hoop and set in the pocket. Now, Charles has a sweet custom hoop and more over his tail light is set in the frame!! I dig it and so did Charles!! I first started off with a rough cut, on both sides. I tried using 1/8″ fine line tape to mark where I wanted my final cut to be. I ended up just using the bottom edge of the tank as my guide line and making the cut free hand. I made templates of each side and cut them out. I made the templates oversized to later be trimmed down for a tight fit. Ok, so Sean came to me with a little project. He wanted to flatten the sides of his Honda tank, “the flatter the better”. I started out by making really rough cuts, just to get some material out of the way. Then I started to map out my final cut with 1/8″ fine line tape. This was working well, but in the back of my head I was remembering Sean saying “the flatter the better”. So, I noticed that the bottom seem of the tank was nice and flat. I was able to use that as my guide line to making a nice flat cut. After I had my final opening I needed templates. The easiest way to make those is a set of dirty hands. I placed a piece of paper atop each opening. Then using my hands I rub the edge of the openings. This leaves a outline of the shape I need. When transferring the template I add a 1/8″ all the way around to make sure its oversized. I will latter trim it down to an exact fitment. After I had the templates trimmed down it’s time to weld them on!! Sean also wanted a new gas cap and bung so I welded the one he provided in place. I was happy with the end result, at first I wasnt to sure about the flat sides. But seeing the finished product my opinion was changed. I ground down my welds, pressure tested for leaks. Oh yeah, Sean liked it too!! I forgot to take photos of the finished tank so next time I see Sean hopefully Ill remember to take some. Well, I finished Aaron’s Kawasaki 440 twin. I can say that I am stoked on the end result and Aaron was smiling when he rode off, so I think he liked it too. I thought the stock look was good, it just needed a little cleaning up. So in no particular order I shortened the subframe and hooped it in. I also made a new seat pan to match the new subframe, getting rid of the bulky stock seat. I shortened up the original fenders, cleaned and painted everything. Aaron designed the seat stitch pattern and polished the center of the gas tank. This was a fun bike to transform and a definite head turner!! I started by removing the seat and fender to find my cut line and start hacking! Starting to look better already! I cut just before the 2nd to last crossmember. Now the fender sits right where I want it. It tucked in real nice!! Time to start on the seat pan! You can see I have the outer edge of the pan started here. Once I had the outer edge I the proceed to build a skeleton structure. Also I make a mounting tab where the seat will attach. 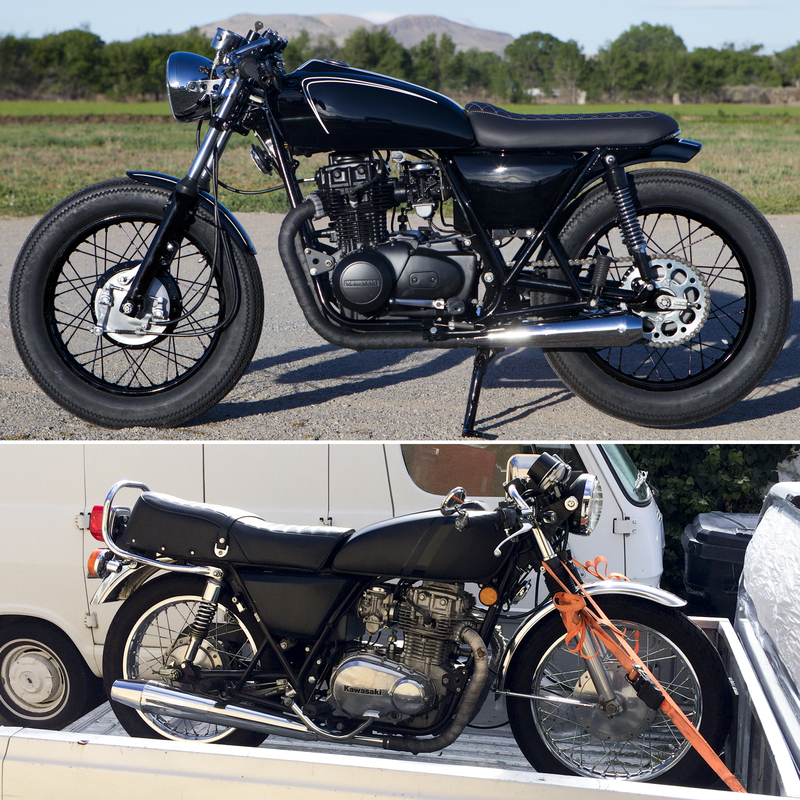 OK, an Albuquerque local got ahold of me and asked if I could do some work on his ’81 Kz440. I said “hell yeah”!! Aaron had a list of things he wanted to do. I would say this is the first step. Here I was to shorten the subframe, shorten the rear fender, add a rear hoop, and make a custom seat pan. I stopped the frame about mid-way over the rear tire, made a hoop, and burned it in with a slight angle. Next I was on to the fender. Reusing one of the original fender mounts I cut off the subframe, I moved it further in toward the motor and burned it in. This allowed me to use the entire rear fender while making it appear shorter. Once the hoop and fender were done all that was left was the seat pan. I always make my seat pans by tacking and building right off the subframe. This allows for a clean tight fitment. Once I have the skeleton built I cut it free and skin it with 20ga steel. © 2019 The Shop Blog | Swerve Customs. All rights reserved.